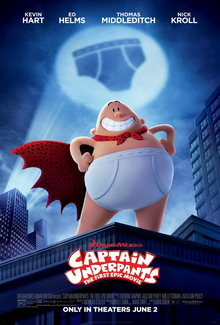 Captain Underpants: The First Epic Movie is a computer animated film produced by DreamWorks Animation that was released in June 2017 in the US, based on the long-running book children’s book humor superhero series. George (Kevin Hart) and Harold (Thomas Middleditch) are the 4th-grade comic book authors who created Captain Underpants, who is pretty much Superman except all of his powers are toilet-related and instead of wearing a cape and underwear on top of his clothes, he wears a cape and underwear on top of nothing. They’re known for being the class clowns, always pulling pranks on the teachers, and the principal Mr. Krupp is always looking for a way to bring them down a notch. Mr. Krupp decides to pull the ultimate power move and split them into separate fourth grade class with the intention of destroying their friendship. Desperate, the boys sneak into his office to try to prevent this, and when they’re caught in the act George uses a toy hypno-ring which (surprising them both), actually hypnotizes Mr. Krupp. They plant a suggestion that Mr. Krupp is actually Captain Underpants. They discover that whenever he is touched by water he becomes Mr. Krupp, and whenever he hears a finger snap he turns into Captain Underpants, and so to keep their friendship intact they keep him as Captain Underpants pretending to be Mr. Krupp. “What about ‘Copper Penny’?” Lois spread her hands out in front of her like the name was on an old Hollywood marque.